From minor services like oil changes to major repairs we are skilled and ready to service your vehicle with care and thoroughness. With over 40 years of experience, we have the knowledge to give you the best service possible. BOSCH, a leader in the development and manufacturing of automotive systems and components for more than 100 years, has the expertise, the information and the experience to provide exactly what you need. Bosch supplies every major OEM worldwide with a variety of precision components and systems, including body electronics, safety and braking systems, gasoline and diesel fuel injection and engine management systems. This places Bosch in a unique position to provide the training, information and support to help the automotive professionals do their job better and more efficiently. 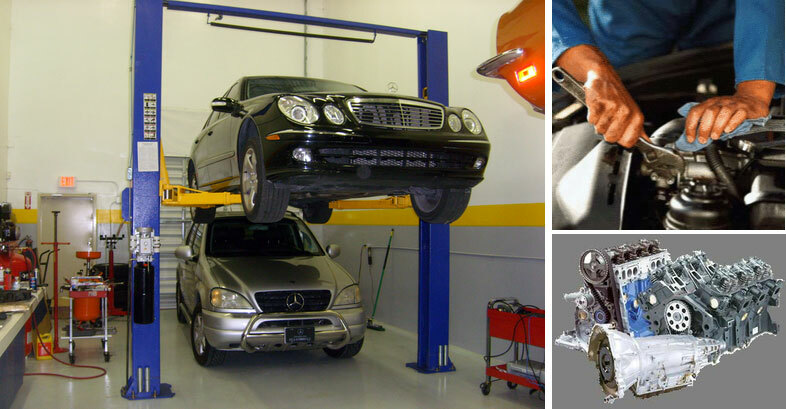 The Authorized Bosch Car Service Center (BCS) program is designed to assist the independent automotive repair specialist, in improving and expanding service on all vehicles equipped with Bosch systems and components. Under this program, businesses apply and are considered for appointment based on a number of criteria, including: location, accessibility, appearance, customer waiting area, technician training, number of bays, tools and diagnostic equipment on site, etc. Authorized Bosch Car Service Centers are backed by a firm commitment to service excellence. In sales, equipment, technology and training, BCSs receive full support from Bosch and access to all the elements necessary to help run a first-rate operation. Having the proper technical information right at your fingertips to diagnose and repair a problem can mean the difference between completing a job on time or not. . . and having a satisfied customer or not. Bosch makes its Electronic Service Information available to all Authorized Bosch Car Service Centers on a subscription basis. The complete DVD set contains automotive application lists, where-used listing, OE-Bosch cross references, part number interchanges electrical parts lists and exploded views, archive electrical parts lists and exploded views, wiring diagrams for passenger cars and automotive systems repair and test procedures. Bosch also provides a toll-free Technical Support Line to answer immediate questions. One of the most valuable benefits of the Authorized Bosch Car Service Center Program is the complete series of in-depth factory training programs and seminars made available to your technicians. These programs offer a combination of classroom and hands-on training covering subjects including engine management, anti-lock braking, traction control, vehicle dynamic control, vehicle safety, electrical, and electronic systems, as well as On Board Diagnostics. Training is conducted over a 4-day period (for most classes) by highly qualified Bosch technical instructors at several convenient locations. When a technician completes all training classes, plus a qualifying electronic program, the status of Bosch Master Tech is awarded. Authorized Bosch Car Service Centers are granted authority to verify customer warranty claims, to decide a course of action and to perform the necessary warranted repair. This authority extends to warranty service for aftermarket replacement parts on Bosch systems only. BCSs may perform warranty service for the customer free of charge.